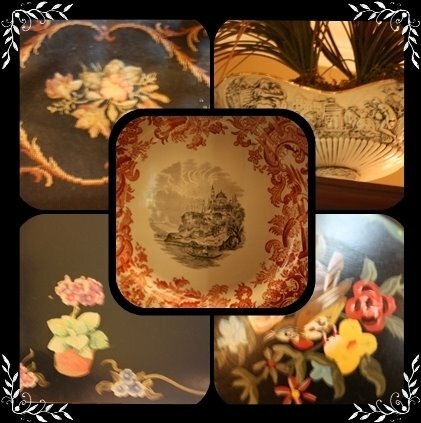 BARGAIN DECORATING WITH LAURIE: MOSAIC MONDAY IN THE BOUDOIR! 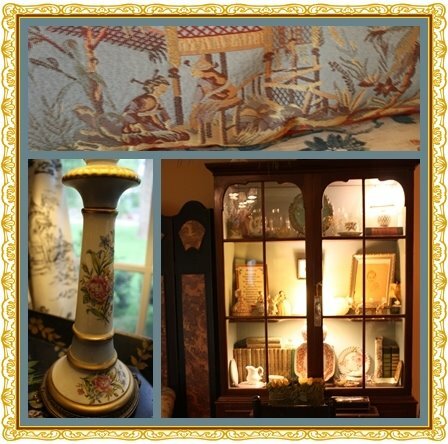 MOSAIC MONDAY IN THE BOUDOIR! There are wonderful mosaics in Blogville today. 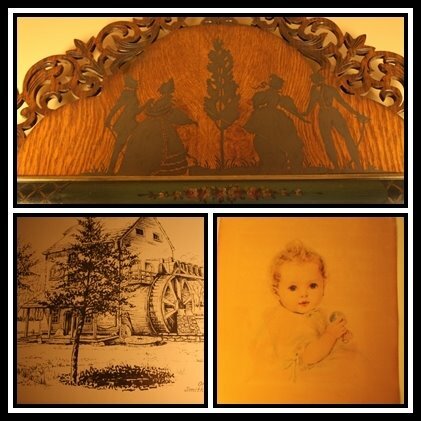 To get the links, go to the blog of our hostess, Mary at Little Red House. You'll be so glad you did. I am posting photos of our bedroom, because a couple of my blog readers requested that I post it. Again, I need to post my disclaimer. I am not a decorator, so these pictures are not being shown to demonstrate the way to design a room. They are being shown because a reader requested that I show them, and I love my blog readers soooo much that I'll do almost anything for them! 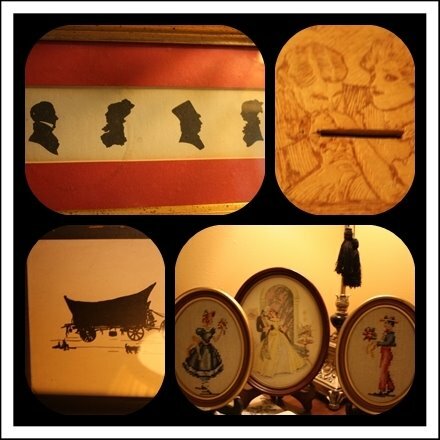 and some more silhouettes and some more toile. And there is NOT a color scheme! 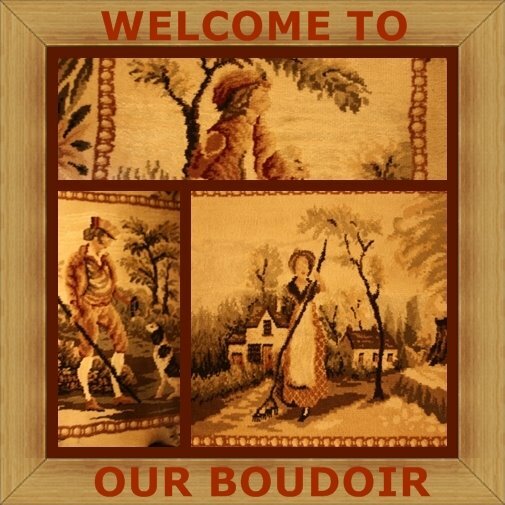 I just looked up the word "boudoir" in good old Websters (on line), and I learned that it is a room where a lady sleeps, but I let my husband sleep here too (most of the time anyway)! This is a good example of how extreme I am at not having anything match (sometimes it's intentional). My husband recently asked me "Don't we have two nightstands like the one on my side of the bed?" I replied that we do. He then asked, "Don't we have two tables like the one on your side of the bed?" Yes. "Then why do our nightstands not match each other?" Because I don't like for things to match! Yes, we all know I need a psychiatrist, but don't tell my husband that! This was the sofa in my parent's living room. I am so thrifty (cheap) that I cannot bring myself to have it reupholstered, since it is still in good condition, so it doesn't "match" the rest of the room. Of course, I'm not much into matching. Ooops! Somebody left the remote on the table. We seldom use the t.v. that is the armoire in this room. It is primarily there because if I'm in the bed sick, I like to have the t.v. available. Last week, one of my grandchildren wanted to watch t.v. in this room, and we realized that when we had an ice storm several moths ago, the satellite box on this t.v. went out, and we didn't know it until now! You may have read on my blog before that the "drapes" in this room are tablecloths from Tuesday Morning. In this photo, you can see the drapes that were already in this living room. They were pretty drapes, but, of course I wanted toile. I hung the original drapes and the black and white toile tablecloths on those curtain clip-ons like a double shower curtain is hung (every other hook holds the toile tablecloth). I wanted the fullness of the previous drape in addition to wanting a solid color to face the street, so the original drapes hang behind the tablecloths (got it?)! This is the tablecloth with the original drapery concealed behind it. Does this count Shelia? That pointy thing sticking out from behind my faux roses is my elbow! You did a wonderful job making it cozy and so you, so your inner decorator won out if you ask me. ;-) Beautiful room, just beautiful! Your room is lovely! It looks very homey and loving...I think that is the look you were going for too! I think the pearls on the lamp is a great idea. Why is it things always look ok in real life and then when you see the picture, you think, now why do I have it that way! I learned this from blogging!! Oh I just love it all, so warm and so many fun things to see. I love toile,don't have a toile room but maybe one day! I have to go back and look at it all again so wonderful. Like how you kept all your framed photos in the same color of frame. They say to do that. I know I am going to have a grouping of photos in our bedroom too when I redo it. Been gathering and reframing some now for it. Lovely, thanks for the fun tour! Wow, Laurie! Your master bedroom is beautiful! I love it. I love toile too. Our master bedroom is done in a blue toile for the drapes (and curtain in the master bathroom). It's the first and probably only time I will ever have custom drapes done. My home is my home just like yours. We don't have to do what the designers say to do if we don't want to. The touches in your bedroom are just lovely. Thanks so much for sharing. had fiesta is assorted colors - I said I did that on purpose, duh ! You are so good at mosaics...love the borders too ...I can't remember if you have the program listed - I will hunt..LOL ! and what are the cushions under the bed??? I'm thinking that is a fabulous idea for storing my dog's bed during the day??? wow,wow!!!! 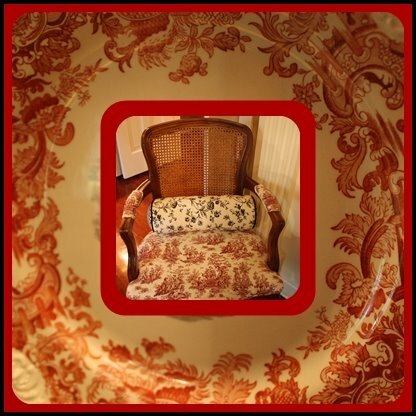 Laurie you have a gorgeous bedroom and all that toile is just beautiful!your pictures are amazing so many pretty things to look at,i could spent hrs in there,love that rug!! !where did you find such beautiful thing??. Your room is GORGEOUS! I love the style of not matching. Great mosaics, all amazing! Gorgeous room, and photos. Love the toile. I love it Laurie. I really have grown to appreciate toile. Laurie, you know how much I love your room, and all the toile. I'm a great fan of toile. Love, love, love the chandy eye candy hanging. Thanks so much for swinging by with wonderful words of support. What lovely spaces! Could you please "not" decorate mine? I would be in heaven there! Your Boudoir is stunning Laurie, I loved each and every photo, happy MM, Kathy. Well you may not like things to MATCH, but they sure all go together beautifully. You must have a wonderful, natural "eye" for design! The old loveseat looks right at home in its original garb, and I love the idea of hanging the new draperies right over the old ones -- no lining, no sewing! Brilliant! Gorgeous room... it's a studio apartment, you have all the comforts one could need, including the husband who's allowed to visit the boudoir! I LOVE your bedroom!! So what if everything doesn't "match"....it looks SO much better this way! It is so warm and cozy! I'm glad it was a long post, I enjoyed every bit of it! what a beautiful, warm and inviting room! Laurie...thank you so much for posting these photos!!! I think I am in love with your room!!! My favorite part is the fireplace wall...it is gorgeous!!! The fact that it was your living room originally gives it an air of formality. I think matching is totally out of style...isn't it? Everything is so much more attractive when it has that collected feel...like your room!!! Your collection of photos is one of my favorite things!!! I don't even want to be in a house that doesn't have family photos...how can you live without them...they are the heart of the home in my humble opinion!!! I consider them to be the real artwork in a home!!! I want to thank you again for sharing all of the rooms that you have shown us so far. I am in awe of your beautiful home and it looks like a wonderful and happy place to live!!! I would love to see more if you feel like you would want to share it!!! I feel like I get to know you a little better every time!!! Oh...by the way...I love your mosaics too;)!!! Have a wonderful day...sweet Laurie!!! What a great room! And I was thinking how big it was and then you said it was formerly the living room - wow - how did you manage that?! Mosaics really are fun aren't they!? Beautiful room! This is beautiful simply beautiful! If you are not a decorator by trade you should be. You are very gifted and talented. Thank you for sharing, I am so looking forward to what other things you have to share. Your mosaics are lovely, and your bedroom OMG, it is gorgeous. 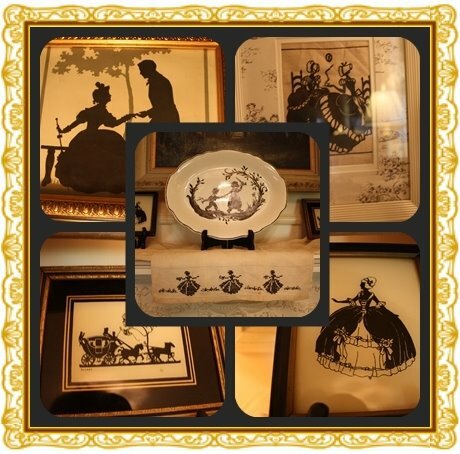 I am a black and white toile fan, and I have it in my art room. Your bedroom is a dream, a fireplace, and all that black and white is stunning. I also love your couch. The Bopsy twins was a favorite book as a child too. So beautiful and cozy! 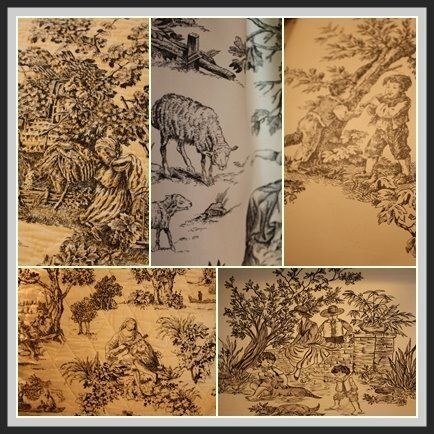 I love all the toile!!! Your bedroom says, "YOU!" That's a good thing. 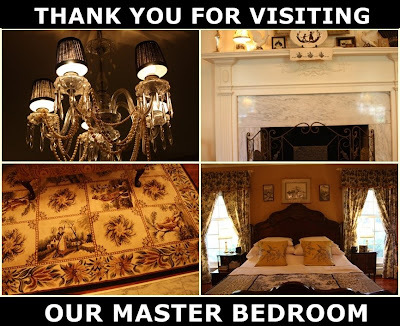 Your master bedroom is so wonderful. I love all the colors and toile and mismatch nightstands. The fireplace is to die for! I like your window curtains. I think I have made a window curtain out of sheets...but never a tablecloth! Very inventive. From the picture I would never have known. Thanks for sharing this wonderful space for Mosaic Monday! Oh and also thank you for stopping by my blog! Huggy Hugs! You know I love toile too - I so enjoyed this post! Your room is so big! I didn't know it was the former dining room - how cool is that! Love the fireplace and it looks like such a nice cozy place to unwind! Oh wow! it took my breath away! I love toile....you are an inspiration!!! this was a beautifulllllllllllllll post! I absolutely love how this room is decorated. Your mosaics are so creative, how do you get so many done??!! You must be Superwoman!! I could look at you gorgeous bedroom for days! You've done such a great job on it!! Oh, forgot to say...LOVE your chandelier and that you have a fireplace in this room...beautiful! I can't believe how beautiful your bedroom is. On first glance it looks like everything matches. I also can't believe that you apologized for not being a decorator. It looks like it was done by an expert! Sweet Laurie, What an adorable post...and a FANTASTIC LOVELY Bedroom. I love each and every mosaic, and each and every way you have decorated this room. Truly it's a room that is full of beauty, relaxing places that make you want to cozy up on a wintry day...and the bed linens are just sooooo pretty. 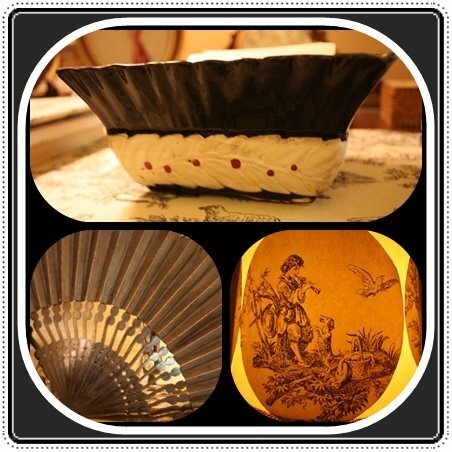 I love black and white toile...and red and yellow toile...I'm like you...I love it all! ;) ~CC Catherine (Thanks for adding my family to your prayer list) ;)You are too precious! Oh, Laurie, this room is so wonderful. As I started looking at each picture and scrolling down, I just couldn't wait until I got to see the whole room. Thank you for sharing. I would just stand in that room and stare at all the beautiful things. When I got near the bottom and saw everything put together, you did not disappoint. I love all the toile. Everything does go together, even though it doesn't "match". Hugs. Laurie, I don't know how I managed to miss this, till now!!! Your bedroom is gorgeous! I love every single bit of it!!! Girl, you don't need to give a disclaimer about your decorating. You have a gift!! Oh, Laurie! I adore your beautiful bedroom! You have so much space and I love how you've decorated it. It reminds me of a lovely home in England! I love everything you do - punch the decorator's in the stomach - you've got it going on! Yes, yes! That picture will do! I've a few more Divas and I'll post you with them soon! I absolutely love...it's so Southern and classic! I love the linens, the furniture, the chandelier, and that gorgeous fireplace. I just want to curl up and read a book in that beautiful room of yours! It's so beautiful! wow, it's like a boutique hotel! I can't believe you live in the glorious surroundings, makes mine look extremely humble! Love love love this room of yours! I love that things are not matchy matchy! Keeps the eye looking for what next treasure it can find which , in your room, are plenty to find! The necklaces on the chandy, all the toile, everything so personal and lovingly picked out for each space you can tell! Heaven's to Betsy, Laurie! 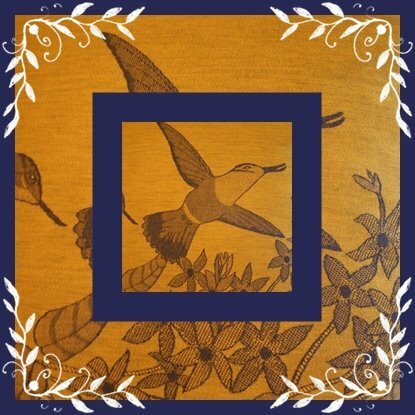 I'm a new follower of your blog and so happy I stopped by for a visit. Your bedroom is absolutely fabulous! Just gorgeous. Can you set up a little cot for me in your bedroom ? It is so pretty and neat. How do you do it all ? Do you not need much sleep ? he rest of your home is lovely, also, but Im stuck on your bedroom with the bedside tables that don't match. Love it ! I think this bedroom is fabulous! 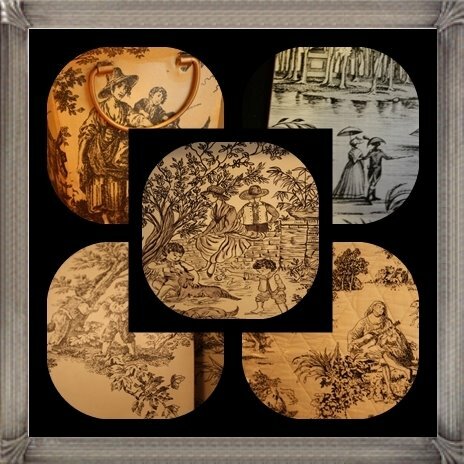 Your tale of toile' looks wonderful in your room. You do a great job on your decorating. I love that lighted hutch!